The outspoken National Chairman of APC, Adams Oshiomhole, has confirmed that the ruling party will submit the name of Hope Uzodinma as the party's guber candidate in Imo state. According to PREMIUM Times, Oshiomhole, who was reacting to comments made by the governor on the outcome of APC primaries, described Okorocha as “an embarrassment” to the APC. Recall that Okorocha on Thursday, after meeting President Muhammadu Buhari, said the party chairman is destroying the party with his method of handling party primaries. 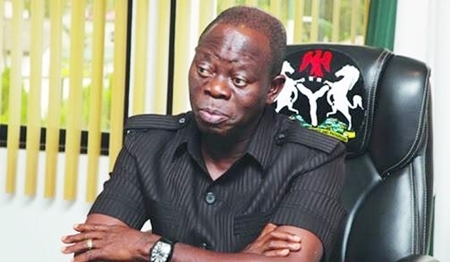 And in a swift reaction on Friday, Oshiomhole accused the governor of imposition of candidates in his state. Oshiomhole declared that the “NWC has met and we have upheld the result of the Gulak committee and we have prepared the name of Hope (Uzodinma) to be submitted to the INEC. The national chairman, who has been accused of mishandling the party, assured Nigerians that his party will defeat the candidate of the main opposition People Democratic party (PDP) in next year’s presidential election.